The patented Glide-Pro concept grew out of the need to solve safety and utility issues. The Glide-Pro bearing system reduces door closure problems by eliminating all metal-to-metal contact, eliminates the need for washers and lubrication and allows doors to swing easier with less driver effort, reducing the chance of injuries. Since no metal parts touch other metal parts, no corrosion can occur between dissimilar metals. 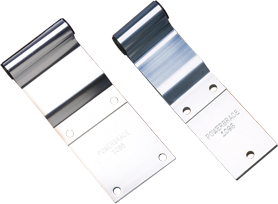 Powerbrace hinge assemblies are designed to withstand the harsh corrosion conditions and severe racking forces of highway, piggyback and marine container service. Glide-Pro extruded aluminum hinges include our patented keyed and flanged bearings that are proven to reduce wear and protect doors better than conventional hinge assemblies. We designed Glide-Pro Heavy-Duty Hinges to outlast the life of your trailer. These hinges keep doors properly aligned and more secure because they don’t wear like conventional hinges. Cycle-test results confirm that Glide-Pro aluminum and steel hinge assemblies showed less wear to hinges, pins, butts and bearings than other hinge assemblies tested. 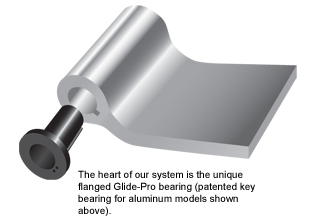 The heart of our hinge system is the Glide-Pro flanged bearing. Glide-Pro hinges are available in a variety of finishes. All steel hinge assemblies are available in either ¼-inch or 5/16-inch thickness and are Hot-Dip Galvanized for maximum corrosion protection.